It's Friday! And here comes another Fabergé object! How unusual... This week I have another pretty bell push for you to wonder over. This one was made by workmaster Mikhail Perkhin, sometime between 1896 and 1903! 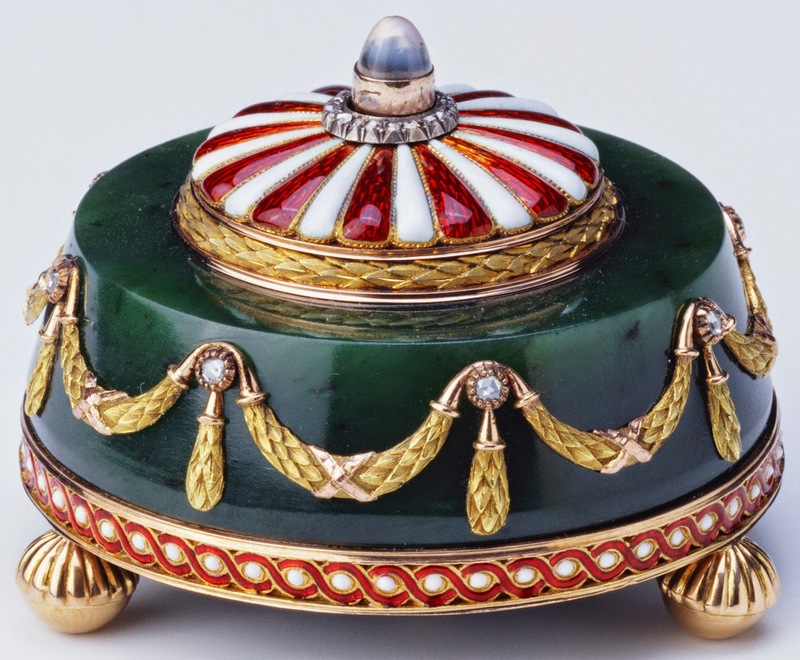 The bell push is made of nephrite, and decorated with swags of three-color gold. It stands on gold feet, over which runs a border of red and white enamel. The top is decorated with radiating enamel beams in the same two colors. The actual push button is a moonstone. The dimensions of the bell push is 1.5'' x 2.3'' x 2.1'' (3.9 x 5.8 x 5.3 cm), and it now has it's place in the Royal Collection.